This is one of our new deer decals ' Beanfield Alert '. Showing a couple huge bucks putting down some serious groceries knowing the rut will be on in a couple months. 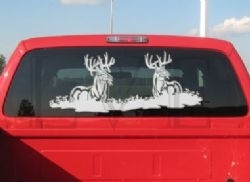 If you're a serious big buck hunter then here's a must decal for your rig so grab one or more today! If you need even larger decals call 270-275-9702 to place your order. Select Size: 13" x 5" [Add $4.00] 26" x 10" [Add $18.95] 9" x 4"